Muddy Pond gold mine tailings site, Nova Scotia. 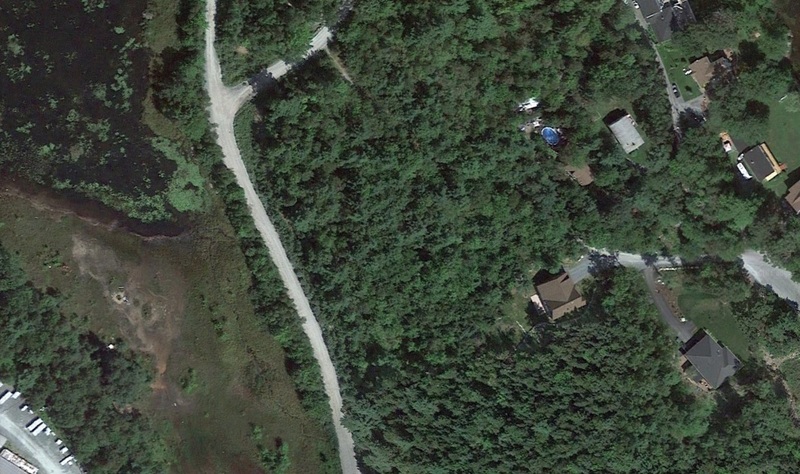 Someone has dug a pit onsite, which is also visible as a small pock on the Google Earth image. The Muddy Pond tailings site is a deceptively normal- and somewhat healthy-looking ecosystem, in that a strange kind of vegetative ground cover gives the impression of boggy “naturalness”. Linda explained that this particular blackish cover is seen on many tailings sites. To me, it resembles the root system of moss without its usual proliferation of a dense green, microfern-like top layer (though some minor green can be seen). The telltale tailings cover of stunted vegetation. In fact, if one didn’t know it was a contaminated site, one would most likely think it pristine. Absent of any odour, stark barrenness, fencing or obvious signage, the Muddy Pond gold mine tailings site is settled into the landscape like a quiet imposter. Deer tracks dot through the squishy waste that contains even higher levels of arsenic than the Montague site. A nearby pond sparkles in the sun, the recipient of mercury and other toxicants leaching into its system. Houses sit nearby unawares. I collected a couple of soil samples from this site as well, which I suspect might have some microbial activity, given the top layers. Surprisingly, the soil dilutions that I had prepared from the Montague site and cultured in the lab, showed absolutely zero growth of anything living after 24 hours. This was a bit alarming to me. I will check the tests again after having left them to incubate further over the weekend. The dilutions were prepared in ultrapure water, at 10-1, 10-2, 10-3, 10-4 and 10-5 and I streaked 8x 10-3 and 10-5 dilutions of the two different samples, then incubated them at 4˚C, 22˚C and 30˚C, plus controls at room temp. These different temperatures cater to different microbial “preferences” – some are thermophilic (like the C. metallidurans) and grow best at higher temps, some are psychrophilic and grow best at low temps, and others will grow at a wider variable range of temperatures. Some dilutions were plated on the beef extract nutrient agar that I have been growing the C. metallidurans on, and some (most) were plated on the widely-used, standard plate count agar recipe that soil microbes will typically grow on. Again, the results of all my tests: Nada. Zilch. No life. Dead zone. These wasteland samples (undiluted, far left) will next be used as the substrate for culturing the C. metallidurans. If this resilient little extremophile thrives OK in such extreme conditions, then we are in business because I will be one step closer to proof of concept and the guerilla inoculations can begin.